Gopal Lama wants to overturn traditional Nepali fatalism to rebuild the school that was destroyed twice – once during the conflict and again in the April 25 earthquake. Lama, 48, firmly believed in the power of education to stop the trafficking of children from the Helambu region and 25 years ago founded the Yangrima School (pic) in Sermathang village, 39km northeast of Kathmandu. During the conflict, the Maoists bombed the school, and Lama's family finally rebuilt it in 2009 only to have it destroyed again in the April earthquake. “If we don’t educate our village children or put them in a safe place, I fear that they will be trafficked into brothels,” Lama tells us. After the earthquake there has been an overwhelming outpouring of help from young, socially conscious Nepalis. One of them is Prabhat Khadka, 30, an IT professional from Kathmandu. 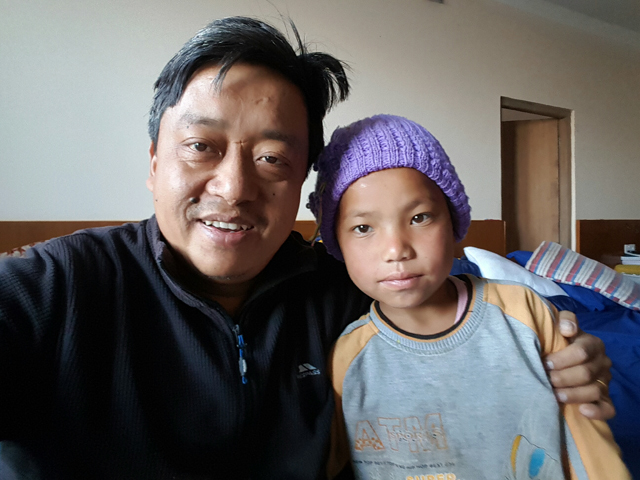 Khadka and his friends were trekking in Helambu in 2014 and chanced upon Yangrima School. “We saw children studying in a peaceful and natural environment amidst mountains, and that really appealed to us,” Khadka recalls. When the earthquake hit, he immediately contacted Lama to offer his help. This month, Khadka’s group rigged up the school with wifi and trained students in data entry so they can generate income for their families. After the earthquake, many older teachers decided not to return to remote schools in Sindhupalchok. Schools remained closed, but Yangrima could reopen thanks to young and committed volunteers from all parts of Nepal. Kishor Bhatta, 27, left his home district of Baitadi in the far west to teach Nepali here. “This area needs help and I feel that I can make an impact,” he says. 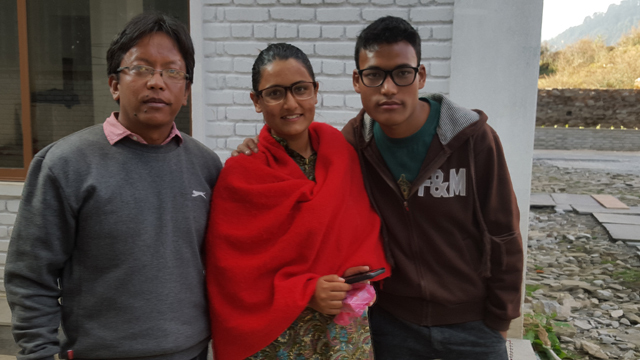 Dikshya Shah, 21, wanted to heal quake-affected children through her drama and psychosocial therapy skills. In June she quit her job in Kathmandu and made her way to the Yangrima Hostel and Crisis Centre, where she currently works as a warden, looking after children who have lost parents in the earthquake. “This has been the most challenging job I’ve had, I have so many kids to look after. 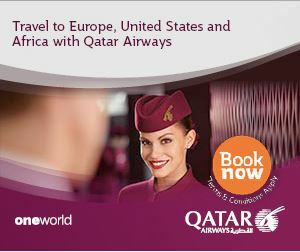 But the smiles from the children make it all worth it,” she says. Sixteen children who lost at least one of their parents from the village of Balgoan attend the Yangrima School. Most lost mothers who were preparing lunch when their homes collapsed in the earthquake. 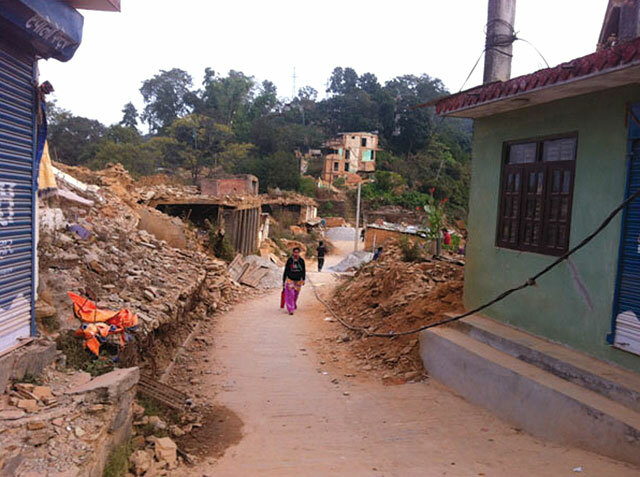 Balgoan is home to 140 Tamang families, all of whom lost their homes. Sukmaya Tamang, 13, grabbed her six-year-old sister, Budumaya, when the shaking started and ran out. Their mother was in the field and was killed by a landslide. Her body was never found. “I want to be a nurse so that I can care for the injured,” says Sukmaya. Yangrima has started a sponsorship program for support of children like Yudhir and Sukmaya who now live in single-parent households. Sermathang at 2,700m is a scenic village in the Helambu region of Sindhupalchok of Tamang, Magar and Yolmo people. Helambu is steeped in the Tibetan Buddhist Yolmo culture and has many monasteries. The Yolmo may have migrated from Kerung in Tibet 300 years ago. A popular Helambu trekking route begins from Shivapuri National Park continuing along Chisapani, Kutumsang, Tharepati and Sermathang, and then ending at Melamchi Bazar. A five-hour hike from Tarke Ghyang is Ama Chomu Yangri (3,771m) with stunning views of Langtang and as far as Kanchenjunga in the east. Eight months after the earthquake it is hard not to be struck by the magnitude of the losses of people in the communities that were affected. Their stories are filled with sadness and loss. 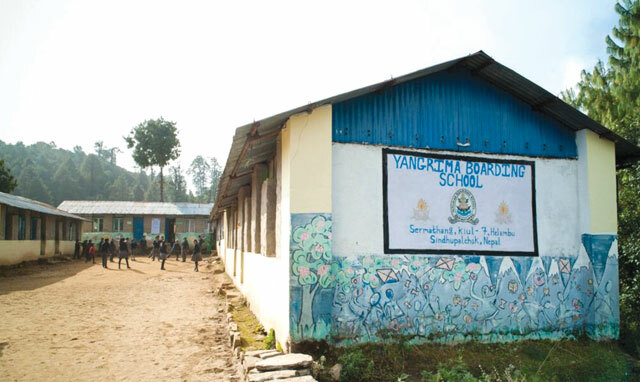 The Jana Jagriti Higher Secondary School in Sangachok of Sindhupalchok was built in 2004. Nothing of the building remains, seven students perished during the second earthquake and many more have been bereaved of parents and grandparents. The school was closed for a month. When it reopened, the children were changed: less joyful and playful and sometimes confused and angry. The school now has eight temporary classrooms made from corrugated sheets, windowless structures offering no protection from the elements. Teachers and parents work on supporting children as best as they can. The school now teaches children first aid, and encourages students to express their concerns about their loss and their future through artwork, discussions and song. Children also have earthquake drills. Women survivors are struggling financially to rebuild their lives. Working the fields is essential if they are to feed their families, and doing this is not possible if they are also caring for their young children. The school therefore also supports families by providing much needed care for the children. Despite all these challenges, the school is a positive place, and the children are as they are elsewhere -- looking to the bright-side of life. In the district headquarter of Chautara there is little evidence of any significant rebuilding. Many residents feel let down by the government as the promised relief materials and money has not arrived.The better off are able to bring in materials despite the blockade and are reconstructing, but these are mostly commercial properties or apartment blocks. Many families are living in tents and shacks. The hospital in Chautara was destroyed and it is housed in tents supplied by the UN. The sick and injured patients and their families are spending these cold winter nights under canvas. 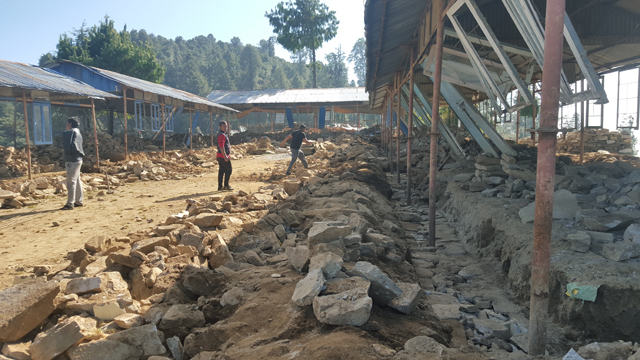 The Jana Jagriti Higher Secondary School like many other schools and communities in Sindhupalchok and other districts still need help to reconstruct and rebuild their lives. 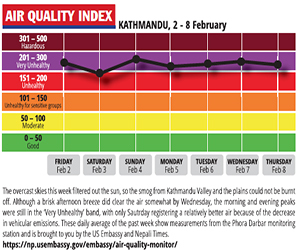 Is what happened to Gorkha a sign of things to come?